﻿ Hively » Does Hively provide any reporting data? Hively has a set of general reporting capabilities which are available to all customers, as well as some advanced reporting capabilities which are available to customers on paid plans. Hively provides you with data on your customer happiness and team member performance on the ‘All Ratings’ page. This page is accessible by all Team Leaders and Account Administrators. For Team Leaders, only ratings for members of their team or teams is shown whereas for Account Administrators, ratings for all team members are shown. To get here, click on the ‘All Ratings’ page in the top menu. You will be taken to the All Ratings page. On this page you can filter the ratings by Happy, Satisfied and Unhappy and indicate if you only want to view ratings with WOW’s and/or comments. You can view this data for the last 7 days, last 30 or all time. You can also choose to view this data for your entire team, an individual team member or your customers. To view for a customer simply filter by their email address or their domain name. Example: ‘bob@acme.com’ or just ‘acme.com’ – no quotes needed. 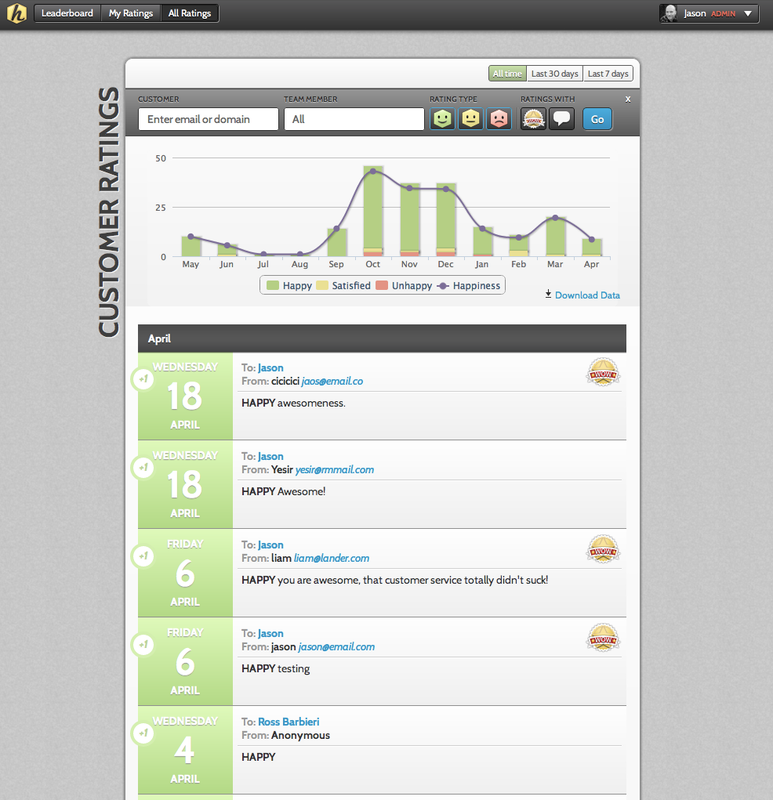 The top section will show you trends for your different rating types and your overall customer happiness. It will also display each individual rating below so you can see details. All of this data can be downloaded into a .CSV file. Remember – you can also get a summary of your teams performance emailed to you daily or weekly by activating this notification. In addition to the general reporting capabilities, customers on paid plans have access to Hively’s advanced reporting features. To access this, select Reporting from the main menu. Fundamentally, two types of reports can be run – summary and detail. As their names suggest, these fields aggregate your data. When creating a summary report, it’s important to mix the above fields with fields that it makes sense to summarise your data on. For example, Member Name plus Total Ratings would be a great summary report whereas Rating Id plus Total Ratings wouldn’t. As every rating has a different Rating Id, Total Ratings would be ’1′ for every row and therefore wouldn’t convey any meaningful information. Fields that typically hold unique information like Rating Id or Comment are better suited for use in a detail report. Detail reports contain information on every rating that matches the criteria you specify. So for example, if you have received 100 ratings that match the criteria of your report, the detail report will contain 100 rows. In a summary report, those ratings might be aggregated up into only a handful of rows, depending on the fields selected. Detail reports are great for displaying data that doesn’t make sense to summarise, for example, listing out all ratings that have a comment or seeing the details of every rater that has left a rating. Public: Whether the rater has given permission for the details of the rating to be shared publicly. E.g. on your website or Wow Wall. How can I get this type information on my team, MAU Human Resources. We currently have two on the team, but I will shortly be adding a third. I need this info for 2012 by quarter, if available. This information is available on the ‘All Ratings’ page inside of Hively. Free plans can access data for the previous 7 days, while Premium plans have access to the full set of data.